In Eleven – End of the Last Ice age we saw the sequence of events that led to the termination of the most recent ice age – Termination I. 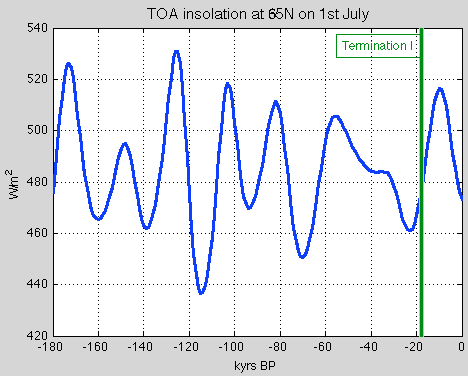 The date of this event, the time when the termination began, was about 17.5-18.0 kyrs ago (note 1). We also saw that “rising solar insolation” couldn’t explain this. By way of illustration I produced some plots in Pop Quiz: End of An Ice Age – all from the last 100 yrs and asked readers to identify which one coincided with Termination I. And for a more visual demonstration of solar insolation changes in time, take a look at the Hövmoller plots in the comments of Part Eleven. The other problem for the Milankovitch theory of ice age termination is the fact that southern hemisphere temperatures rose in advance of global temperatures. So the South led the globe out of the ice age. This is hard to explain if the cause of the last termination was melting northern hemisphere ice sheets. Take a look at Eleven – End of the Last Ice age. Now we’ve quickly reviewed Termination I, let’s take a look at Termination II. This is the end of the penultimate ice age. The traditional Milankovitch theory says that peak high latitude solar insolation around 127 kyrs BP was the trigger for the massive deglaciation that ended that earlier ice age. The well-known SPECMAP dating of sea-level/ice-volume vs time has Termination II at 128 ± 3 kyrs BP. All is good. The Royal Anti-Science Society of Edinburgh? Mann Made Global Warming Is Real! My best estimate: less than 1C warming if CO2 level is doubled. Harde Greenhouse effect 30% smaller than IPCC say. Climate scientists are Nazi Paedophiles? Was NASA responsible for Global warming? Cosmic rays, CO2 and clouds.